And now.... A few pictures and some words about the big weekend up in Iowa, July 13th, 2013! As time passes, I'm hoping that some of the other details about the ride will come flooding back to my brain. This might be an indication of how rough things might have become for me, late in the day on Saturday the 13th. I can usually recall sights, smells, sounds, and conversation from rides like they had just occurred a few minutes ago... but, this time, aside from some exceptions, there remain gaps in the portion of the ride I participated in (the first 410km). The photos will likely help my memory, but, there is so much to cover - in mileage - the post, had I remembered every detail, would quickly become a chore to read (and write). As much as I enjoy writing... well, I need to get back to riding, too! For now, enjoy! The highlight (at least from my persepctive) of Madrid, IA. 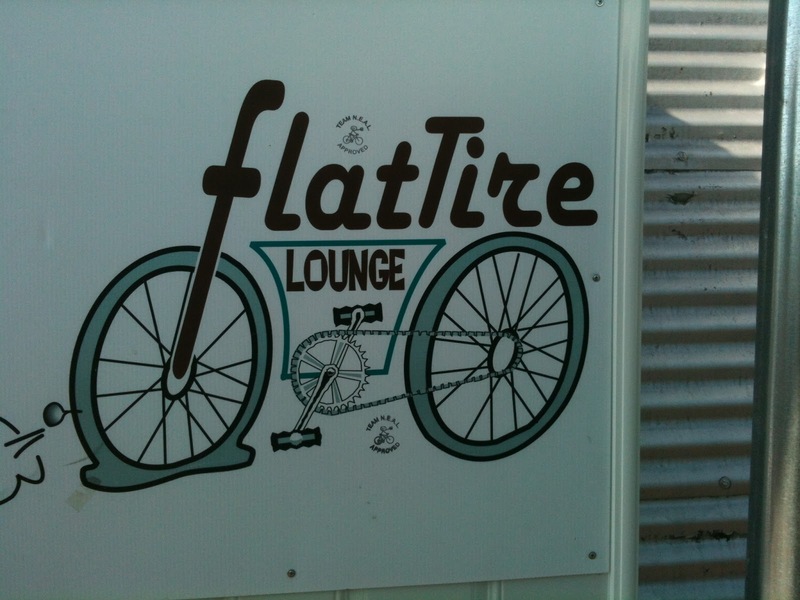 - the Flat Tire Lounge. It's a bicycle bar, no kiddin'. CHEAP draws, and great atmosphere.. right off the High Trestle Trail. I wasn't lucky enough to make it to this spot on the route before it closed at 2am, so I'm really glad we'd decided to pay it a visit during the evening on Friday, after arriving in town! My goal next time is two-fold: okay... three... #1: FINISH 600k. #2: See the High-Trestle Trail bridge lights ablaze (reach it before midnight), and #3: arrive early enough to enjoy a beer at the Flat Tire.. and maybe close 'er down. A GREAT bar, a great town, and a great trail system. 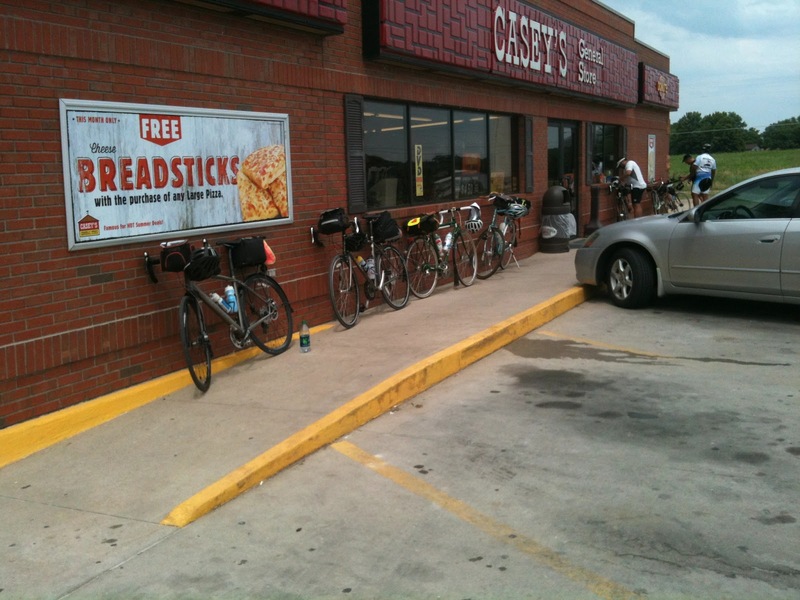 Central Iowa is just the business when it comes to cycling culture, and I had no idea, really. I'll be back!! Glen R. chatting it up inside the Flat Tire as Terry B. looks on; we four KCUC brethren talk shop and tactics for the big ride. 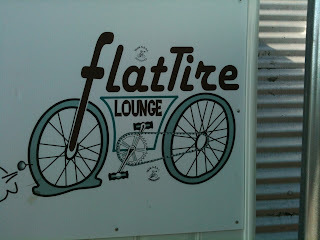 Tales from the vaults mingling in the humid air amid the clamor of thirsty trail users.... MAN, I can't help wonder how many hundreds of cyclists would flock to the trails in Kansas if there were even one "Flat Tire Lounge" located along their lengths! If you build it, they will come... indeed! Terry and I prepped our stuff, and laid things out for the morning - a process that took surprisingly little time compared to ride prep I've performed in the past in a hotel room. I guess that's the byproduct of meticulous packing, and not bringing along too much stuff. This was a big deal, but, I really only needed to have stuff ready for day-2 upon reaching the hotel room again, some 20 hours later. Aside from that, the general kit remained the same as for any other ride. The cue sheet was thicker, but, that was about it! Not bad, and a big step forward for me. Terry and I settled in, while Glen and Gary occupied the RAAM-wagon mobile command center RV out in the parking lot. The sun dipped while we watched the last 50 miles of the latest Tour de France stage unfold on television. Lights out. After a surprisingly good night's sleep, my alarm stirred us, and we began the morning's activities. Shower, food, roll the bikes outside, check in with the RBA. Find Glen's missing gloves... ultimately find mismatched glove, turned inside out, it fits. Check. That's resourcefulness! I felt fresh and ready... mainly because I hadn't crawled onto the bike yet! From L to R, Terry B., Gary D., me, and Glen R.
The sun begins to paint the eastern sky pink and blue, while Greg Courtney (Central IA RBA) gave pre-ride information and details of the route, weather, safety briefing, etc. Just a few minutes before 6:00AM... the start cometh! A shot from Glen's camera along Lincoln Highway, maybe 5 miles into the ride, Gary D. enters the frame at left with his orange safety vest, the Minnesota kit gent and the red Camelbak gent are pacing up for their 300k, maintaining a good pace, and I joined David M. for a few miles' worth of chat before our two routes would separate. Way ahead, only visible if zoomed, are the faster 200km riders, eating up the road. Sadly, we'd pass them only a few miles later, with one of the group suffering a flat; a real shame, as they had been setting a monster pace - two young women with tri-bikes, and a third strong guy. Thumbs-up shot, on the road to Maxwell, IA, and the first control - somewhere along route S27. It's almost too warm for the vest, but the sun won't come out! One of the last photos of me from Glen before I'd lose the ability to hold his wheel after Polk City, mile 45, roughly. After the Maxwell control, Glen and I catch up to Terry, effortlessly pedaling away -- seriously, the guy makes it look easy! Overcast, muggy, and warm... heck, it beats freezing temps and headwinds! Genuine smiles, after a spring of hard Kansas City training starts to pay off! I can even tell by my body language in the photo above that something isn't quite right - arms locked, back arched... I wouldn't really begin to feel the results until nearly the century mark, but I'd been continuing a rotation of pedal 10 times, slide forward, push self backward with knees and arms, repeat. After a few miles, Glen and I would leave Terry behind, and ultimately, Glen would begin to pull away from me. It was beginning to shape up like a typical 600k... few companions, if not solitude... I had hoped to be able to hold together with one or two guys the entire day, yet, I remained motivated to make that person Glen. What it created instead was a more-tired me (and frustrated, especially after having done well at White Cloud in June). I began to settle in to the idea that I'd be alone for some hours. Gary? Whooof.... LONG gone at this point, he'd passed us on the road to Maxwell, and wasn't around when we finally arrived. He keeps it moving! There was a lot to see after Maxwell, but I neglected to reach back for my camera for any of it. Some of the sights will stay in my memory - truly unique and outstanding. Passing a little time involved diagnosing a rattle on Glen's bike, which ended up just being some loose cargo inside his rack trunk -- frustrating, however; gosh don't I know that feeling! After miles of really nasty "diamond-pattern" grooves and grating along K-7 only a month ago, can't really blame either of us for being paranoid about random rattles, though; I think we're both still waiting for something big to fall off our bikes. After reaching Polk City along a long, LONG stretch of open rural highway, we crossed Saylorville Lake - an experience in itself, as the bridge is marked with wind socks and warning signs about the potential for strong crosswinds! Thankfully, the wind had been light - but traffic and proximity to the guard-rail filled my head with images of my smartphone/camera twirling off into the drink below. LONG bridge, too! My usual view of Glen R., the strongman, super-diesel atop his fresh new rando-stallion. Based on the time-stamp, I think this is somewhere between Maxwell and Polk City, but, not 100% sure. Always a great riding companion, but, ultimately my road speed and control times would extend into the realm of the impossible. Hard to bridge up to what you can't see! Glen started to make good time on me, and Terry was also up ahead - having left Polk City quickly to give us a constant rabbit up the road, of sorts. He was convinced that we'd be able to consistently catch up to him, as we've proven in the past - but, for me, it wouldn't last much longer. Glen and I made Granger, IA. together, but after turning south into the SE head/cross wind, he began to eat up the road ahead, leaving me unable to answer. Still sliding forward and readjusting, it never occurred to me to check the saddle angle markings themselves for evidence. This part sounds weird, but it's a pretty real thing: my favorite bike shorts also happen to be the slipperiest - made from very smooth Lycra - and on a fairly new leather saddle, sliding around in them was something I'd grown accustomed to. Apparently, after about 1,000 miles, the saddle surface roughens enough to negate this issue... but, this day, I kept sliding forward, ultimately riding along on my tender bits - which began to cause issues. That kind of discomfort creates the inability to push the pedals as hard as I would prefer... and the results were beginning to show. In my head, I figured I was just having an "off" day. I started to apply the usual "wait fifteen minutes" logic... but after an hour of waiting, I started to wonder about my chances. Adding to my mental situation, watching riders with which I can normally keep pace begin to disappear into tiny neon-colored dots, miles up the road, began to eat away at my good mood. Ugh... too early to feel this way.... keep pedaling! One of the highlights of the ride, we then navigated onto the Raccoon River Valley Trail, which is a converted Rail-Trail, covering over the old Milwaukee Road - which, the RRVT folks have a great website which covers the history far better that I can here. It's - honestly - a GREAT trail, and one of the best I've ever ridden. The other "best" comes later in this same ride! Amazing riding up here... for real! Dallas Center, IA. depot, restored! Bikes, bikes, bikes... I couldn't BELIEVE how busy the trail had been, and this is a trail that requires a day-pass purchase, enforced by wandering wardens looking for your tag/pass. Our ride registration handled that part for us randonneurs. The pavement, bridges, and old trestle structures were all in terrific shape, and the fun continues for 89 miles! You could do nearly a 300km ride on the RRVT, and never need to mess with a lick of road traffic, save for the occasional at-grade crossing. BLISS. The Raccoon River, I trust? Glen snapped this photo... and, weirdly, I barely recall passing this neat waterfall scene, complete with folks fishing and dipping their toes. My brain may have already been on its way to check-out. If memory serves, I have a picture of Glen and I stopping at a water fountain, and chatting with a couple of local trail riders who'd been saving a special upper-cut to the face for whichever weather forecaster had uttered "light winds" the evening before. The winds had been anything but light! We continued once again onto the great RRVT, for another 10 blissful miles. Hundreds of riders - no kidding - hundreds... the trail was packed, but everyone was courteous and well-paced. With a slight benefit from the SE wind, and a bit of wind-tunnel effect created by the tree-lined right-of-way, I began to try and make up ground on Glen and Terry. At some point, again, I had lost track of them - but I knew they'd likely be just ahead, maybe just around the bend. Occasionally, zipping along the trail at 23 MPH (! FUN ! ), I thought I'd caught glimpses of Terry's reflective triangle... or was it Glen's? Who could tell, but, I might have been gaining? Foolishly, as often happens with me, I chose not to just settle in and ride to the next control - for some reason, it escaped me that if I could "see" them (if that bobbing neon yellow triangle about a half-mile ahead WAS either Terry or Glen), then I'd meet them at the next control in ten miles, where we would ALL have to stop. Instead, my ego chose gears that my body couldn't.... well, you know the rest of that one. In the blur of shadows and riders passing the opposite direction, amid the occasional overheard tune from someone's iPod speaker system (perhaps a good headphone alternative... one of the 300km guys was jamming on some tunes that way! ), I tried like a moron to bridge up to someone, anyone, to maybe salvage a draft, and keep someone in arm's reach should I miraculously recover from the growing pain and mental stupor I seemed to be drifting into. Perhaps it's my defining characteristic. Perhaps this is a reason to get into really good shape, and race masters? Pfffff-shhhyeah.... as-if... But, that "all push, no brains" mentality maybe isn't the best for rando... although, it had worked for Jure Robic. Since we're tossing around metaphors I can't possibly back up, I will say that it felt a lot like that highly improbable gap closing, that last-ditch effort by a lone racer in Le Tour, desperate for the sweet taste of the podium steps... peloton breathing down his neck, he never looks back... but just focuses on that bobbing neon-yellow safety triangle affixed to his worthy "opponent." Redfield, IA. Casey's... after a while, these places all begin to look exactly the same. Evidenced by the photo above, we all joined back up at the next control. It had taken every last yard of the 9.8 mile long RRV Trail section to confirm I'd indeed been chasing Terry. Who knows how long he'd been on the trail before I'd given chase, but I was proud enough for being able to knock off a dead-flat personal time trial to bridge the gap... no matter how stupid of a move it really was. Sometimes, I just have no patience. I should become a for-hire tandem stoker, and just leave the thinking to someone else. Yeesh. Within seconds of each other, Glen, Terry and me - all rejoined at the Redfield Casey's for powder, water, food, and rest. Eighty miles accounted for. A bit less than 300 to go... and I was whipped. Clearly, I had come to the event with a 200km rider's mentality. Worse things could happen -- at least I'd begun to grow numb enough to no longer be in too much discomfort, pretending that's a good thing, somehow. Next, the leg to Audubon, IA, 48 miles distant. Terry, confident that we'd catch him again, (ha!) mounted up after a quick stop, and started on his way. Other 400km riders came and went, too, as I operated in a bit of a haze. I do remember someone hollering at one of the 400km riders, a younger gentleman on a gorgeous burgundy Trek 520, who had begun heading the wrong direction from the control... who knows how long it would have been before he'd have realized his mistake, but we got him turned the right way 'round. Before long, Glen and I mounted up, and headed out, too. It was about 20 miles until the next town with a c-store -- the route on day one proved very forgiving, services-wise, with stops (controls or otherwise) evenly spaced almost every 20 miles on the nose. It made for easy planning! It would take, however, only a fraction of that to lose Glen's wheel again. Time to settle in, and start to ride with my brain instead of my ego. I smiled to myself, and started to just pedal what I could reasonably manage. Still convinced that nothing was amiss with the bike, I also came to the conclusion that stuff was just going to hurt... deal with it. Glen, making headway as the giant expanse of central Iowa bids farewell to the myriad small towns, and expands into endless farm fields and rolling hills. Bye, bye, Glen...at least for a few hours. The next 20 miles would begin to collect on my mind as some of the most scenic and satisfying of the entire journey... although, I was drifting in and out of mental acuity at times. For example, I don't remember this at all. This photo comes from Glen, somewhere along this section of the ride. I'm not sure WHAT I was thinking about, or looking at, when I drifted past this grave marker (? ), which is curiously positioned RIGHT at the edge of the small culvert/ditch separating the highway from the field in the background. Is he buried in the ditch??? Weird... and, there should certainly be a story behind Mr. J.E. Moss's headstone placement. Me? I didn't even see it. Thanks, Glen, for this photo! More information on the photo above: J.E. Moss was a Civil War veteran from the area, and these markers are found around the land he'd originally owned, which was sold to the state for used in the construction of the Lincoln Highway. More information can be found here , here , and here. The Lincoln Highway? It was America's first transcontinental route, I believe opened or declared completed in 1919. We rode along this magnificent road for quite a few miles, and I didn't know much about it until arriving back home. Pretty cool... and it gives me a great idea for a future self-supported cross-country tour route. Eventually, I did pull the camera back out for a few shots of my surroundings... the expanse of Iowa overcame my senses, and I recall just coasting and thinking "wow" as I stared off to the horizon in all directions. No traffic... no others riders could be seen... just the open road, and me. Sometimes, this is exactly how I prefer life. ...and to the north... trust me... the photo doesn't do justice to the scale of the landscape... those trees are a lot farther away than they look. It seemed like I was completely alone, isolated, dropped onto a ribbon of highway in the middle of a giant farm tract which never seemed to end, and isn't broken by fences, phone-poles, or mile markers. The road just seemed to go on forever. More of the same, the sun begins to burn off the clouds of the morning, as the day turns to afternoon. My smile here is larger because I'm squinting a bit more than usual: a byproduct of not having worn my usual cycling glasses - which provide more eye protection. The other half of that smile is the result of some honest hills. Hills have long been my friend - a challenge each time, and far better than the monotonous act of pedaling along on a flat for hours at a time with no break. Do I like hills, or do I like coasting?? I'm good at both. Iowa's hills are far longer than the grades I'm used to in Missouri and Kansas... which was a good thing! The forward-looking companion to the shot above, you can see the road extending straight west, off to nothingness, with a few hills tossed in for fun. This stand of trees would be the closest any of us would get to shade, save for the rail-trail sections. Exposed during July's heat and humidity... an extra layer of challenge. The next dozen miles covered, I inched closer and closer to the turn-around control at Audubon, and some food and drink. Hydrating well-enough, I felt alright -- but I knew that I hadn't had to take a nature break in a very, very long while. Still sweating, however... no headache, no cramps... all good. I took a few more swigs from my ever-lighter water bottles, just for good measure. Despite growing discomfort, I knew I was at least getting the hydration thing right. A few more miles pass, and I come upon a rider changing a flat tire on the edge of a small creek overpass -- I signal for a thumbs-up, but there is no response... heads-down, tube and tire in hand, he clearly had things in order. He had been on the opposite side of the road, also, which meant only one thing... I now knew exactly how far ahead the faster riders had been. Whoof... but, really, I suppose it wasn't too terrible, considering. At the time, I maybe had another 3-4 miles to the control... in only 128 miles, however, the fast bunch was still eight miles ahead... probably more, without the flat. A mile later, Gary D. and another rider flew the other direction with big smiles and waves... which I returned. Gary D. is showing the kind of form that I remember seeing from the Warbird... focused, with no concerns for the distance itself... just one speed: hard. My phone is ringing again, with the caller-ID showing "wake up." I have to ride my own ride, especially at this point in the day... the point where I'd normally be signing my card at the LAST control, I was still just 1/3rd finished with the ride. Another mile, and here comes Glen, over the hill joining the small loop that would take me through Audubon, to the control, and then back out of town on the same road. Glen looked good, fresh, smiling... but, he also indicated that he certainly felt like he'd just ridden 130 miles, for sure. None of it was "easy", no matter how much the case it appeared to me. We chatted about the day a little, and what the rest of the route held in store for us. I quietly hoped to catch up to him and maybe ride the night section with a restored group, but I knew better. 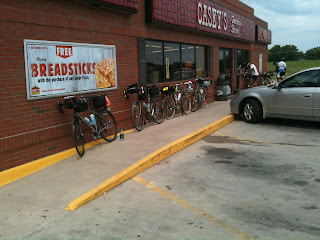 Even if Glen had taken a very quick stop at the Casey's I'd still yet to reach, he was at least 30 minutes ahead of me. The good news involved Terry still likely being there, so Glen and I parted ways, and I continued into town for the next signature on my card. Upon arriving, Terry had just begun preparing to depart - which was a bit of a bummer. Too prideful, I refused to ask if he'd mind sticking around for a few minutes, for I knew I wouldn't have been able to hold his wheel anyhow. Sunrise on Sunday, Ralph R. and Dan P. from Springfield making their way toward their official 400km finish. We're only a few miles outside Ames, and though we all commented how strange it was to see the sun rise, set, and then rise AGAIN on the same 400k, it was still a good time.... but, no lie, Iowa holds one tough event! Glen brings it home -- and with a quiet nod to the Tour de France stage winners, he points out the tiny manufacturer's logo on his jersey as he crosses the line! Awesome... and while the day was hot, the wind was stronger, and the sun unforgiving, his pedal stroke looked strong, his spirits remained high. It's a finish... and, if I'm not mistaken, his first 600k! Gary D. in a great shot - flying by at speed, he refused to coast to the finish, it seemed -- focused and driving the pedals, no matter how tired he said he might have been, he looks as determined at mile 375 as he had at mile 15, nearly 36 hours earlier. Strong, strong rider. Make no mistake... that's a single water bottle strapped to an old Astro-Daimler frame, with original running components, 27" wheels, and old-school 52/42 front gearing, and a 5-speed freewheel in back, with 13-24 teeth range on the cogs. This guy is cut from the old cloth, and there is no catching him. While it seems I am chasing EVERYone these days until I get my diet and focus back on track, this guy is quickly becoming the guy I need to chase. Terry B. bringing it home! 600km in the bag, with shadows growing long - the smile says it all! Proof in the numbers, a snapshot of Glen's trip odometer, back at the parking lot in Ames after completing day-2's two-hundred kilometer leg. 600km, signed and sealed! For me, the day became night - the controls became fewer and farther between, and the goal of making it to the Flat Tire before closing time began to evaporate as the sun dipped and the stars and blinking lights of the region's communication towers filled the darkness. Everything had begun to hurt, even the arches of my feet and my jaw bone... but, I joined up with Dan P. and Ralph R. from Springfield, MO., and we three haphazardly traded pulls and mainly just kept each other company as the hours unfolded. Miles of endless highway, long, flat sections of road passing by underneath us while the hemisphere slept. Dancing headlight beams in a sea of black. This stood out as one of the best parts of the ride for me, despite the sometimes demoralizing headwind, which remained until probably 1:30 in the morning, making it seem as if we'd never reach those red blinking lights on the horizon -- which probably belonged to some other city besides Ames, but gave me a target, nonetheless. I made the information control at 12:30am, two hours off the schedule I'd hoped to keep. A nice bench, and a cold drink. Three riders, alone in the darkness, surrounded by silence. My total pace was cripplingly slow. There were brief moments where I felt strong, climbed well - but they didn't last. Ralph began to experience unbearable foot pain, and while Dan had the best push out of all of us, it was simply a long day on the bike for everyone. My issues had radiated out into every limb and joint, and so I caved and finally started caffeine and ibuprofen to hopefully improve my mood and condition. Somewhere in the dark, I quietly quit the 600k... all I wanted to do was get off the bike, and lay down. Things that had gone numb began to sing with alarming nerve twinges which caused me to shudder, and the thoughts of a long recovery seemed to confirm that continuing for another 200k would only make things worse. The thoughts of hitting every last control, and finding none of them open, began to depress the spirit. No Flat Tire, no High Trestle Trail lights on the bridge, no hot food... ugh. Every third and fourth-level goal, vaporized. It took three hours to cover 30 miles to Madrid, and by then, it was nearly 4:00AM. The last 23 miles took until 6:30AM. I was done riding, and nobody was going to tell me anything to the contrary. It was a great feeling, though, to see Gary and Glen burst forth from the RV with thumbs-up and cheers -- even if I was too out of it to show my true appreciation. Hotel achieved, I showered, ate, and got 15 fast minutes of sleep. Decision time. Everything was sore, my mind scattered... but mainly loaded with the word "can't". The wind, the full sun, and the remaining pain - yeah..., for me, in that moment - it wasn't worth it. As it is said, it is what it is. I still had a very memorable 400km! Another hour of sleep, and then a days-worth of regrets and "shouldas", just to get it out of my system, but it was really cool getting to see Terry, Glen, and Gary finishing their ride! As for riding in Iowa.... I am SO glad I went up there! It really ended up being a great ride because of the time I'd spent with friends, and having the chance to ride with some folks that I usually only get to read about. It was a great weekend, and I can't wait to head back up there someday. I am starting to see a pattern, unfortunately - a pattern that needs to be broken. I wrote about 1,000 extra words here, all self-examination and rhetoric, and then deleted it all. It's for me to read, maybe a year from now... certainly 6 months from now. But, I clearly had a lot of personal, internal dialogue to unload -- and the keyboard just happened to be right in front of me. I have since taken those concerns and questions to where they belong: home, with my wife. She knows me better than I know myself -- and that's the best way to sort it out, because it's only bicycling-related on the surface. This (whatever "this" is) is temporary. Those friends and family that are always made aware of my plans will continue to be made aware, for safety-sake. However, I can't ride to create drama that might keep these pages interesting. I swear, creating drama is not what I've been doing... everything you've ever read here is very, very real and captures the moments as they occurred. But, subconsciously, something is going on ... self-sabotage? Fear? Burnout? It's only beyond 400km, apparently... but I know the barrier isn't physical. But, even at the 200k level... every once in a while, "something" always seems to happen. It's not normal for someone of (forgive me) my intelligence and capabilities to keep repeating silly mistakes and foibles, and taking stupid risks with formulas that have worked in the past. Making saddle adjustments the week before a big ride??? A history of getting dehydrated easily, and having a few beers the evening before a 600k??? If anyone should know better.... good grief. I honestly don't get it, and it concerns me that I can't figure myself out. I either need to learn to accept my limitations and say "no", or stop creating excuses and do what I set out to do. Assuming I even want to. Sure as the sun will rise tomorrow, I will be here, and I will be thinking about riding. It's just what I do. But, I need to reaffirm that I'm really okay doing it for ME. The stories are beginning to blend together, same routes, same situations, same outcomes. Only by stripping away all that I have used to hold myself accountable will I truly know if I am riding for the right reasons... only when it is good enough to ride x-number of miles without telling anyone about it will I know. Would I still ride, even if it didn't "count"? I love riding my bike ... the rest is just accessory. Put tape over the speed readout on the computer. Stop thinking, and just pedal. I know how to eat, drink, and prepare. Just execute it, and start enjoying yourself. If something adjusted feels good and doesn't hurt -- don't. freaking. touch. I need to find out... do I really have the inner desire to ride farther than 400km? Is having done X in the past GOOD ENOUGH? Am I letting my automatic self-comparison to the accomplishments of others -- even my own past accomplishments -- stand in the way of my own enjoyment? Is blogging therapeutic anymore, or does it actually CREATE the stress of feeling like I "have to", instead of feeling like I "want to"? Am I, therefore, holding the shovel responsible for the hole I'm trying to crawl out of? Am I already out of that hole, and just too stupid to realize it? If it isn't fun, it really is time to hang it up. For now, I need to stop trying to prove things to everyone else...sometimes I fear I have crossed the line from "sharing" to "bragging" when I do well, and just out-and-out complaining like a whiny child when things don't go well. I don't want to be that guy. I hope to look back on this post and have more answers than remaining questions. Until then, in all seriousness - because you certainly don't have to: thanks for reading. For now, that's what I am going to do. I've decided I need a follow-car for my commutes, with roof-mounted stereo system, please. Volunteers? Just a quick post prior to a larger post with photos. First off, officially, I posted a DNF for the 600km I'd signed up for. I finished 410km, roughly, and made it back to the hotel after sun-up on Sunday - which, at 24 hours plus, makes for one of my slowest 400km rides, and may indicate the toughness of the day. I knocked out the equipment preparedness like a champ, but, physical prep wasn't so hot for me this time... Heck: this year. No sense hashing it all out in print, but I've yo-yo'd on body weight all year (this moment in time being one of the higher swings in recent memory), haven't ridden much, and even signing up for 600, well, even the wife asked (afterwards) what I'd been thinking. As far as packing, though, perfect. No issues with the bike, no issues overpacking or taking along too much stuff. I need to step back, however, and get back to work on ME. Saddle issues that aren't the saddle's fault: The saddle turned on me somewhere around mile 100, which ended up being the result of uneven bolt tension or just me being hasty during the last adjustment. I thought I'd had it nailed after White Cloud last month, but after having zero-saddle issues on that June ride, I elected to slide the saddle back on its rails about 2mm for better knee placement over the pedal spindle. Upon re-tightening the bolts, I put the angle exactly where it had been previously, or so I'd thought. I don't know exactly what I did, but, when I put the bubble-level on the saddle after arriving home yesterday, it was NOT level. Instead, it was pointing slightly nose-down! "What the???" This wasn't apparent to the naked eye, but it was definitely apparent to my gentleman-bits after 100 miles on the first day, and the sliding-forward sensation I'd experienced earlier in the saddle's life was back, bigtime. The only thing I can think is that I'd gotten the angle close, but then gave it one more tweak...but turned the bolts the wrong direction...and never rechecked to see if it was level. None of my commutes or training rides after that had been long enough for me to notice any problems. Who knows, but it's fixed now. Another reason to maybe RIDE A LITTLE before a big event, just to make sure? Gawd, I feel dumb sometimes, and I really don't know how this slipped past me. Riding a little? I crossed 1,600 miles with the completion of the 410km first section of the 600km event. That's about half normal for me for this time of year. Mathed-out, I started the 600k with 1,300 miles logged for the year. 840 of those miles are permanents or brevets, which leaves only 460 miles of commutes or other rides in six months time. That nearly equates to having ridden to work only 20 times this year. Don't be surprised if I suddenly change the name of the blog from "commuterdude" to "guy that drives to work and then rides long distances" dot com. Catchy. Hydration. So nervous to UNDER-hydrate, I guess I swung the other direction and OVER-hydrated. The resulting fluid retention made for some interesting pains and swelling, wherein I went from not peeing at all, to peeing every 10 miles when I switched to straight water at the halfway, to dilute away the electrolytes I'd seemingly over-consumed. Calories. Nervous to bonk, ate too much. Cramps, bloating, discomfort. Hashbrowns on a ride. They don't work. They really never have worked. How come I always forget this when I smell them? Handlebar issues? Hands cramping and numb after mile 200 had me wondering about many things, and it turns out I should have paid closer attention here, also. This change, however, happened very slowly over time - rough roads, impact jarring, etc., my handlebars had rotated down a few degrees, which amplified everything else in turn. I raised them back up to get the hoods and bar "flats" nearly level again. MUCH better... but, it's something that apparently didn't bother me too badly at 200km and below. It's also possible that the saddle angle causing so much sliding forward kept my arms far more involved than normal, so it might not have been the handlebar's fault at all... but, the more level position does indeed feel better now, so I'll give it a whirl for a few rides. But, do I regret going? No. I don't even consider it a "failure." I had -- despite all the issues above -- a good time! I know... sounds hard to fathom, but that's mainly because I'm not normal. I stopped having enough "fun", however, to warrant continuing the last 200km. At that pivotal juncture, the pains I'd experienced had begun to cross over into the category of "won't heal in two weeks." At this writing, things have improved... but, I know I'd made the right choice. Continuing would have pushed me farther over the edge, and simply wouldn't have been smart of me. My only REAL regret is that I should have seen this coming, and I should have - therefore - signed up for the 400km ride, instead of the 600. The difference being, had things gone EXACTLY the same I would be writing this with a 400km finish and July's ride would be in the bag. If I'd felt fresh enough to ride the last 200km, I totally could have... and only the 600km would have been "unofficial". Big deal! But, I would have come home with SOMEthing other than training notes. Minor setbacks, though. I found the wall, pushed on it, and I think it moved a little bit. Issues have been corrected, my forehead has been slapped, and I'm ready to move forward. Still a couple weeks left to get July checked-off. Still half-a-year to get back into a good commute routine. Only if it's FUN. Otherwise...what am I doing ANY of it for?? That proved to be a good test. After letting Terry, Gary and Glen head out without me on Sunday morning, after I'd showered and grabbed about 15 minutes of sleep, I was still torn and conflicted. I hemmed and hawed about continuing, and finally got myself together and suited up in fresh gear for day-two. I rolled the bike outside, lifted a tired and half-numb leg over the top tube, and clicked in. As I pedaled out of the parking lot and onto 13th street, the wind in my face, a clear sky allowing the sun to punch right down into the lower layers of my skin, and pain welling up quickly, I asked myself: "ok...are you having ANY fun right now?" But, I tell ya: despite the DNF, it was great to be back on the ragged edge of long, unknown distances again. I hadn't had the stones to sign up for anything longer than 300k in years, and even though doing so this year proved a mite foolish, I don't see any reason I can't do a 600 with better preparation. I nearly pulled it off without much preparation at all, and while I cannot recommend that approach, apparently it's possible. WITH proper preparations, things like 1,000km suddenly seem tangible... but, one thing at a time here. No, this was not a wasted trip, at all, and I have a bucket full of memories to share. The Iowa group puts on a stellar event, the scenery is top-notch, and the route, the people, the traffic, the trails... riding in Iowa is like a dream. Hanging out and talking shop with the guys over a cold one, the RV road-trip there and back...great times!